> Ants? When I saw that this week’s story was by E.O. Wilson, I figured we were in for something unusual. But ants? Move along, people, nothing here to see. 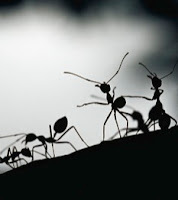 Actually, this “fiction”—which is really just a dramatization (for want of a better word) of the lifecycle of an ant colony—is an excerpt from Wilson’s forthcoming novel, Anthill. (No, I’m not kidding.) So, this is neither terribly interesting, unless you really like insects and happen to know nothing at all about them, nor is it a story. It’s almost a story, though, and for the sake of form, let’s discuss it. I like the beginning, which is sort of Dickensian: “The Trailhead Queen was dead.” (“Marley was dead: to begin with” is the opening A Christmas Carol. We then get some background in a flashback about how this ant became queen and struggled to start her own colony, and then we come back to the issue at hand: she’s dead and now all the other ants have to figure out what to do. So, in addition to Dickens, I also thought of E.M. Forster’s famous discussion of plot in Aspects of the Novel. “Let us define plot. A plot is . . . a narrative of events, the emphasis falling on causality. . . ‘The King died and then the Queen died of grief’ is a plot.” And so, since we have a story that begins with the death of the queen, I was looking for causality. No king in this case, but what was going to happen here as a result of that death? And I guess you could say that what follows—the worker ants fight to save the doomed colony even without a viable queen—is a caused by that death. It’s a plot—it just isn’t very interesting. If anyone has something good to say about this piece of fiction, I’d be glad to hear it. For example, is this allegory? If it is, I haven’t broken the code. >Well, Cliff, it may not be fiction, but you do learn a lot about ants. I actually found it kind of refreshing. >I really wanted to like this (I minored in biology in college), but I'm afraid I agree with you, Cliff. Take all the verbs, change them from the past tense to the present, and for the most part you just have a description of how ant colonies work. It takes the general and disguises it as the particular (not terribly artfully) and calls it a story. I was disappointed. >But maybe there can be something redeeming here if it prompts a discussion of literary genres. (I'll give a nod to Weed here too, because I also thought it wasn't a bad piece of writing, but like Cliff, I didn't find it convincing or satisfying as a piece of *fiction*.) Normally when a writer pushes genre conventions I find it interesting, but I had the opposite reaction here. I guess I have to admit that I can't really put my finger on exactly why, although I give some initial thoughts in my previous post. So, does this story (or "story") give us some grist for talking about genre? >We may have to wait for Wilson's novel to really know how this extraction fits. Can the whole novel really be like this piece? Or did the New Yorker editors, known to weave stories from threads they pull out of novels, do something with Wilson's novel to create a stand-alone piece. One of the things that struck me about Trailhead is its lack of emotion. Not that I expected ants to have emotions, but I was kind of hoping that science would be abandoned and the workers would mourn the queen, maybe hold a wake. Get drunk. Say foolish things. >Deborah Treisman's interview with Wilson indicates that this excerpt is from a sort of novella within the novel, the latter involving humans and the former told from the point of view of the ants. That doesn't answer all of the pertinent questions, but it does seem that the ants-only story is intended to be able to stand alone. I share your general frustration with novel excerpts being treated as stand-along stories with no indication from TNY. >I thought it was absolutely fascinating. It reminded me of the Ant war in Walden. I've never read anything by the author before, but I'll probably buy the book. I haven't changed my own opinion of the piece, but I salute the other readers who have gotten more out of it than I did. >Thanks for that link. The writer has an interesting perspective, but I'm not buying it. >I think there IS some substance to it, actually — it's all in the last two paragraphs, and in a few that formed the divides between sections of the story. I don't think it goes far enough to be an allegory, but it certainly expresses a condition of decay and mortality that we can empathize with, on a different level. That is, just as the ants do not realize the gravity of their impending demise, the inevitability of the colony's dissolution once it loses its sole purpose for existence (the Queen), one could find echoes of human mortality — our inability to grasp, on a visceral level, the reality of our own deaths until it is too late, and all we are left with is the choice to fight or flee. Again, I don't think it's exactly an allegory, but there's an interesting parallel there that strikes me as an attempt to find the human condition in its natural state or something like that. OR maybe it's just a nonfiction piece about ants masquerading as a story. Who knows. Interesting read, either way.